A variation on a classic favorite. The egg is served on top, which creates a luxurious sauce with each bite. Bring a large pot of water to a boil, season with 1/2 teaspoon salt. Add the spaghetti and cook according to the package instructions. Meanwhile, heat 1 tablespoon olive oil in a large skillet. Add chopped bacon and cook over medium heat, stirring occasionally until brown and crispy. Use a slotted spoon to transfer bacon to a plate covered with a paper towel. Remove bacon fat from pan, leaving about 2 tablespoons. Add mushrooms and sauté until softened and turning brown, 7-10 minutes. When the spaghetti is finished cooking, reserve 1 cup of the pasta water, then drain the noodles. To the mushrooms, add the remaining 2 tablespoons of olive oil, 1/2 teaspoon salt, black pepper, parsley, mustard and heavy cream. Simmer for 1-2 minutes. Bring a medium saucepan of water to a boil. Add the vinegar and swirl the water in a circle to create a vortex. One at a time, break the eggs into the center of the swirling vortex and cook for about 2 minutes or until the egg white is firm. Use a slotted spoon to remove eggs and place on paper towels to drain. Add the noodles to the sauce mixture along with the parmesan cheese and bacon. Use tongs to fold all ingredients together. If sauce is too thick, add some pasta water to the mixture and stir to combine. 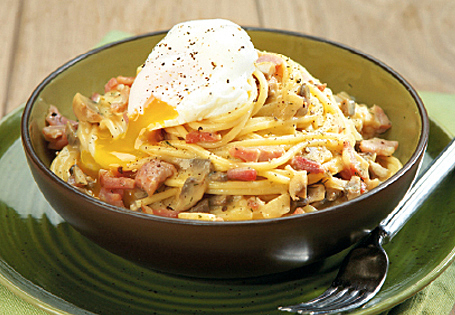 Serve each portion of spaghetti topped with a poached egg and a dash of black pepper.